Song is rapid series of coarse “chips.” climax is alternately slurred upward and downward. Description: Sexes similar. Small, nondescript. 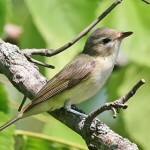 Olive-gray above; light underparts with pale buffy yellow sides; indistinct white spectacles; and two faint whitish wing bars, with the lower bar being more prominent. Short wings make tail look long. 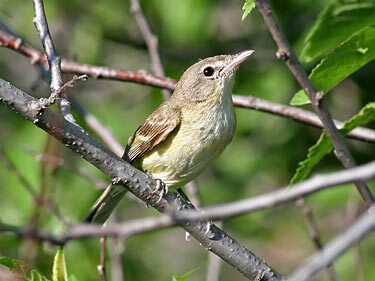 Habitat: Found in thickets near streams or rivers, in second-growth scrub, forest edges, and brush patches. 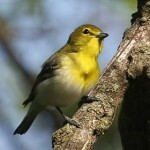 Where in Nebraska: Common spring and fall migrant and summer resident in eastern Nebraska. Becomes rarer westwardly. Breeds locally to the west along major river valleys. Status: Population is seriously declining in southern California, largely due to brood parasitism by cowbirds. 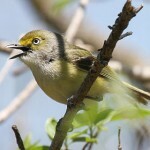 Fun Facts: Bell’s Vireos have not been observed drinking water, indicating they may get all the water they need from their food.